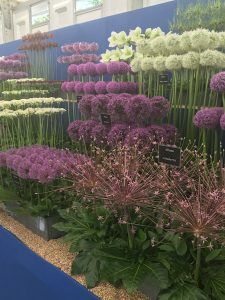 Celebrating its 25th anniversary this year, the RHS Hampton Court Palace Flower Show is the most wonderful annual floral event that takes place the first week of July. I decided to take the core team of Lilys Flowers to the preview of the show which was on Monday evening from 5pm until 10pm and it was such a good idea! We really got to see everything with no crowds – a completely civilised occasion with music and entertainment, such perfect weather – it was like strolling around a fabulous garden party! 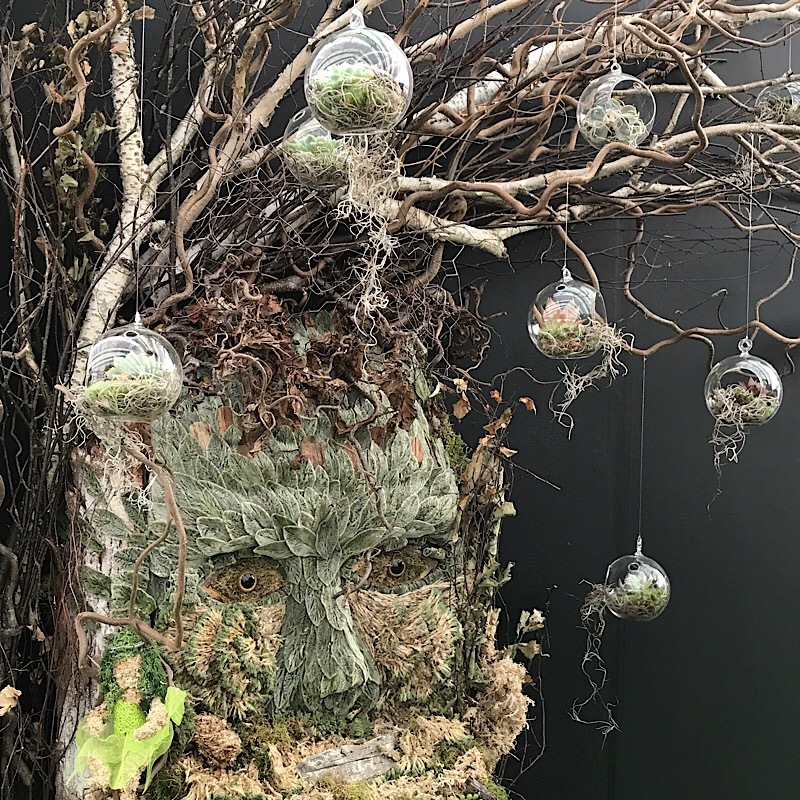 Unlike Chelsea, the show gardens are scattered throughout the show which is lovely as you get to meander through a variety of stands selling all manner of gardening paraphernalia, food, drinks and anything remotely related to flowers. 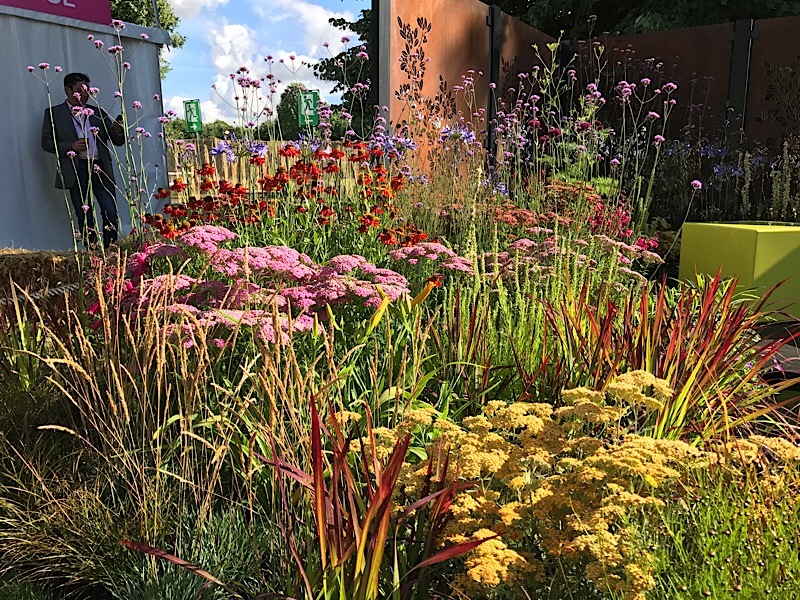 However, there was a little grouping in one area that was very inspiring and lots of interesting planting ideas with meadow style flowers such as achillea, cosmos, agapanthus, dill and beautiful grasses. 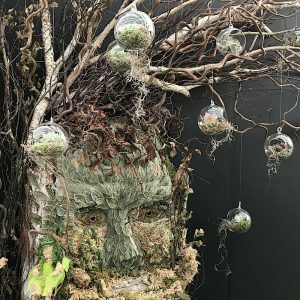 One garden that particularly caught my eye was the entirely edible garden which was designed by award winning garden designer, Juliet Sargeant, who won gold at RHS Chelsea last year. The garden had simple and creative growing ideas for all ‘good life’ lovers out there! 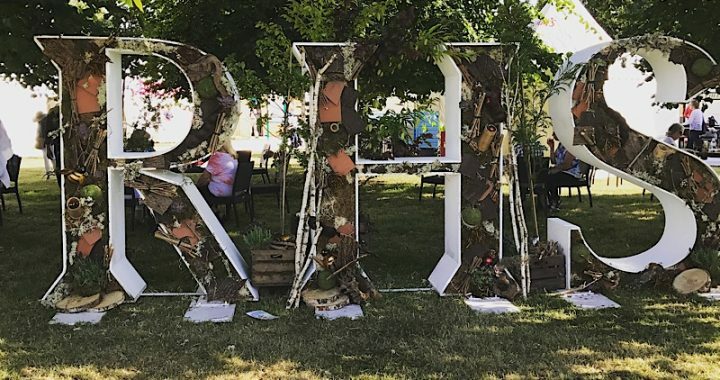 Lots of inspiration for gardeners to take home for their own gardens. 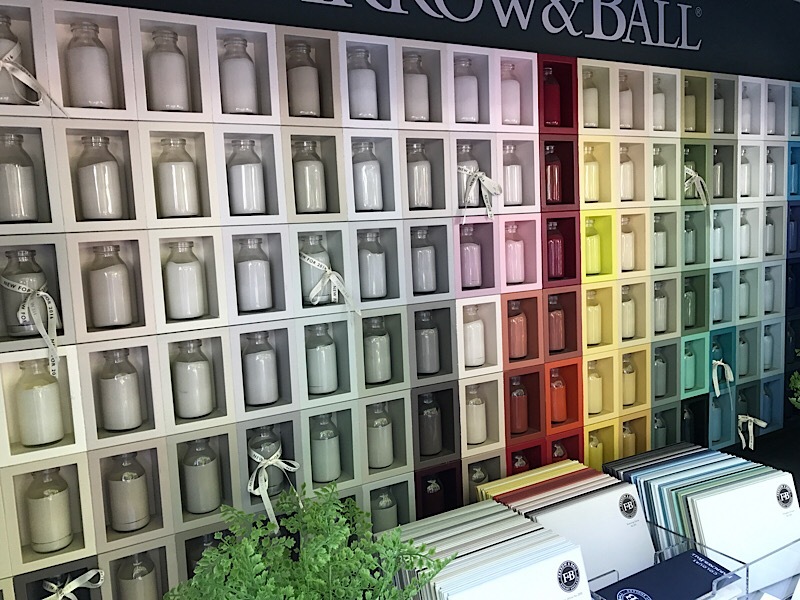 As always, colour is so important in our gardens and cut flowers and the presence of Farrow & Ball was no surprise. They had a cute little old fashioned van with the side up and all their colours on display in little milk bottles – very eye catching and even better, giving away vouchers for free sample tins. If you have never been to Hampton Court Palace before, it is totally awe inspiring with its incredible expanse of water and fountains. The palace itself was built in the 1500’s for King Henry V111 with a re-build slightly later for King William V111 which was set to rival Versailles, which it clearly does. 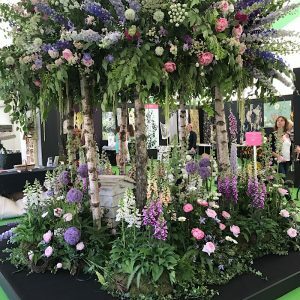 Having said all that – there were beautiful intimate areas under the glades of the trees where people were sitting snugly in the sun that was going down eating their picnics and that is the feel of this flower show – intimate and personal. 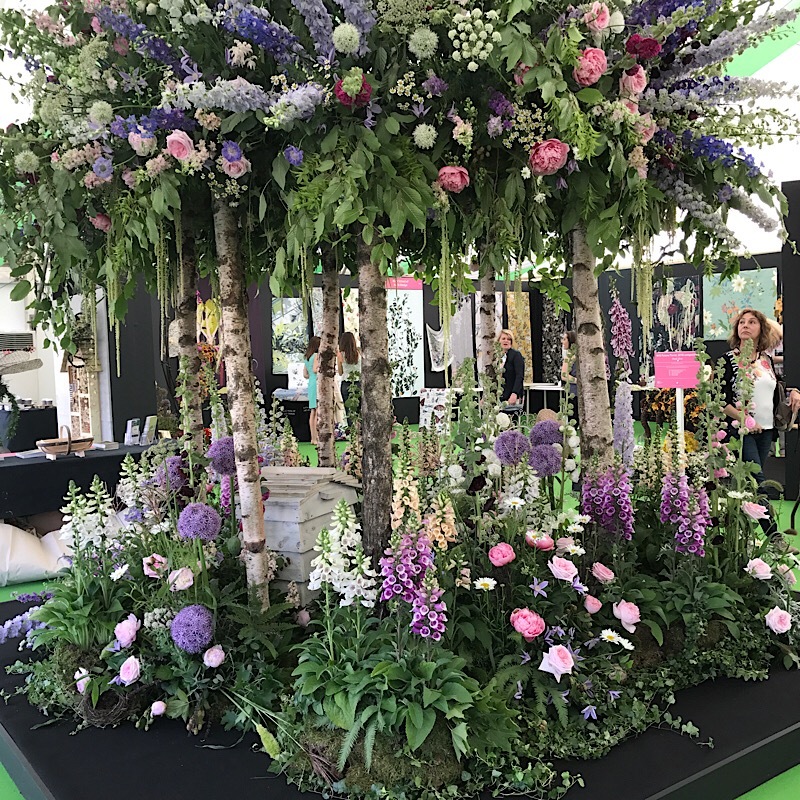 There was an amazing floral design marquee which we were obviously drawn to and the woodland design with the silver birch trunks supporting the floral canopy was amazing. 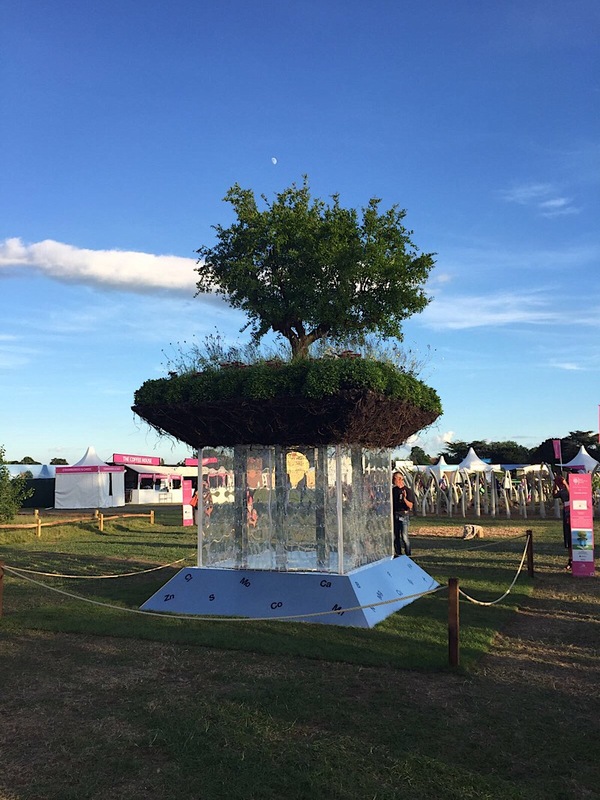 Foxgloves peonies, roses, delphiniums and hollyhocks made a beautiful secret enclosure with a beehive and a little chair leading you to believe that someone had just been sat there whiling the day away. This area lead onto the flower marquee, which was fabulous. The Real Flower Company was exhibiting and the roses smelt so strong and delicious! We also saw David Austin Roses which we love and they had helped to make a sleeping beauty bed out of roses. To the plant marquee next, which was equally inspiring and had all manner of varieties of everything from chrysanthemums to alliums and everything in between. I personally had a cheeky purchase of a ‘Cafe au Lait’ Dahlia which is my all time favourite and has large heads almost the size of dinner plates. 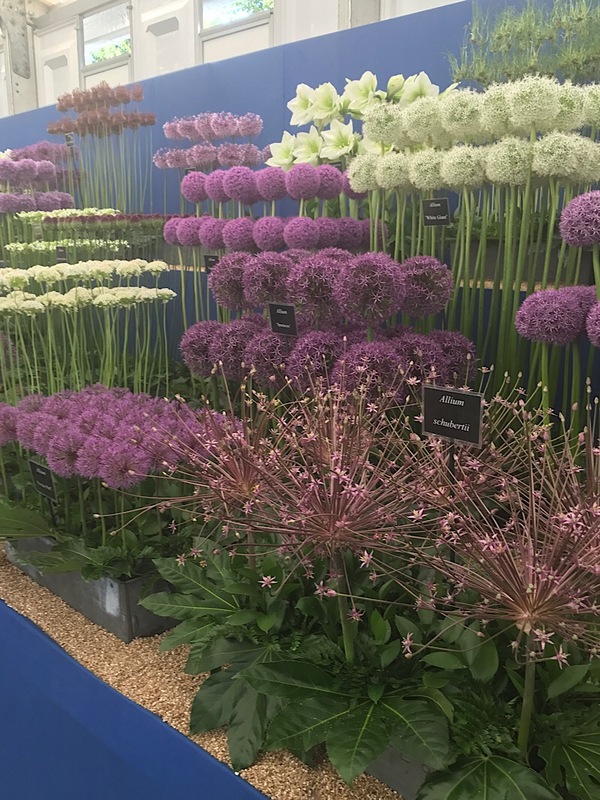 It’s wonderful to see all these new varieties of flowers and plants as when we are designing our floral installations for Royal Berkshire, an Exclusive Venue and other properties, we can be as innovative as possible having seen all of this amazing planting and new types of cut flowers with interesting new colours and shapes. Another favourite of ours at the show was the butterfly house which was near the entrance in a large dome. The temperature was kept to a very particular level and airflow was very important. The butterflies were just beautiful with all different colours and patterns and apparently we visited at the perfect time which was about 7pm. All the butterflies were dancing about and landing on people, it really was quite an experience. We particularly liked the lady stationed at the exit whose job it was to pluck the more adventurous butterflies off of the leaving guests and return them to their friends in the dome! The innovative gardens were as you came into the show and represented a common theme which was how gardening can make a difference to our lives and the world we live in. 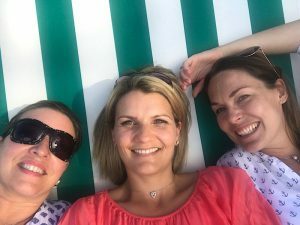 Mindfulness is a bit of a buzz word at the moment but it is also a powerful word. Gardening and being amongst nature and ‘in the moment’ can really help our general well being. 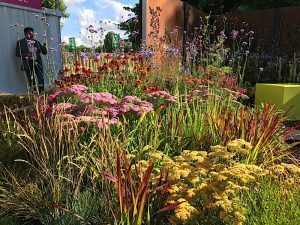 These gardens represented the greater good and how we can make a difference, introducing wildlife into our gardens even in the most urbanised areas. The Village in the middle was a perfect place to eat and drink with rows of brightly coloured striped deck chairs and a few massively oversized ones which fitted three of us! 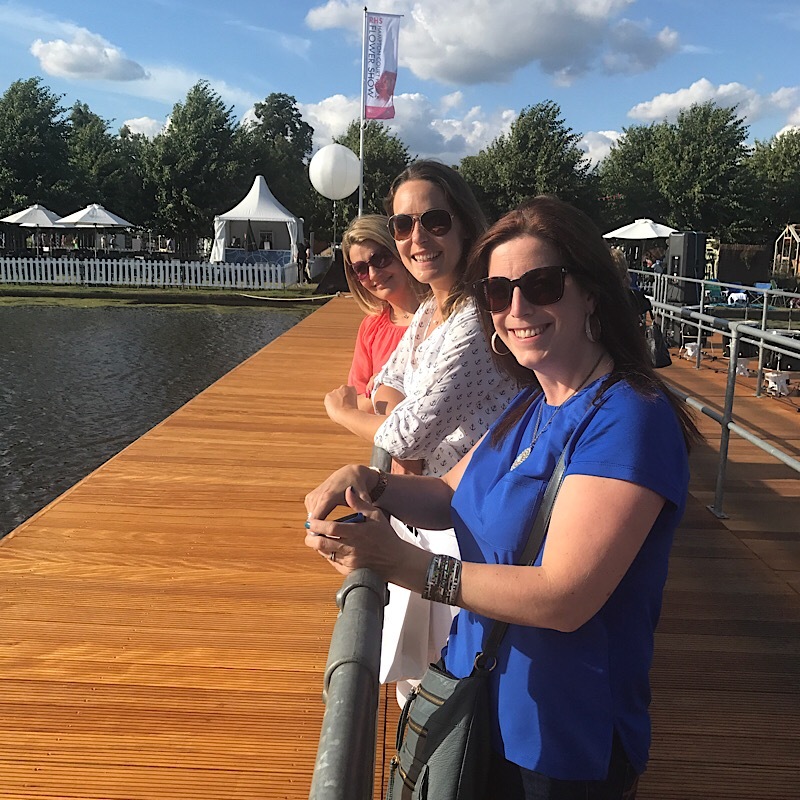 There was a band stand in the middle and we sat and listened to some gorgeous life music with the Laurent Perrier open marquee behind us. 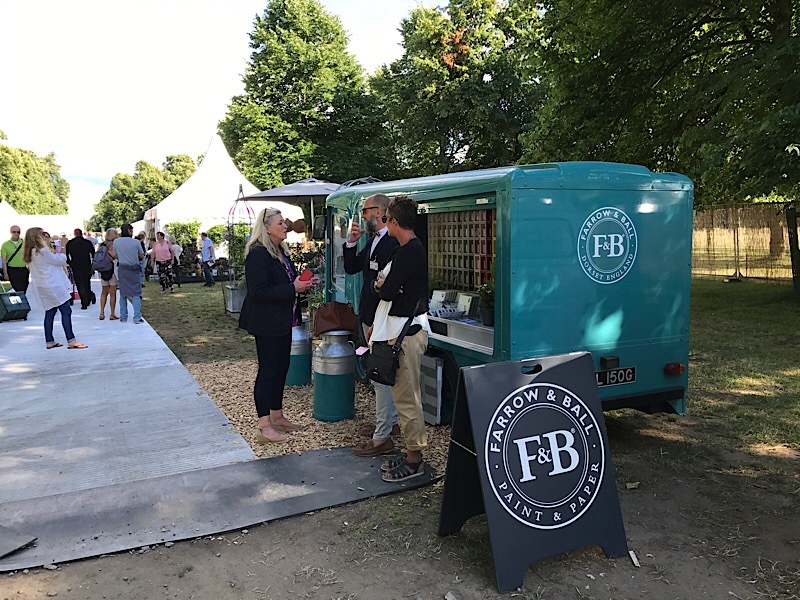 Gin made in the Scottish Highlands, sausages made in Suffolk and all sorts of British family run business were scattered around the perimeter. Posted in News from the barn, Ramblings of a Designer Florist.